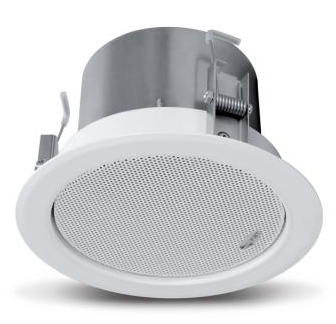 The CSP 406 T/EN and CSP 412 T/EN speaker units, suitable for mounting in false ceilings, ensure excellent reproduction of both speech and music. Made of stamped metal sheeting treated with white scratchproof and non-reflecting paint, they will fit elegantly into any enviroment. Each unit consist og load-bearing ring with quick-fitting hooks with springs for easy securing to the ceiling. 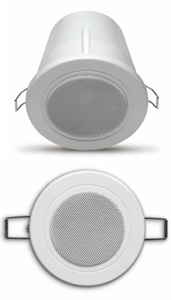 The central mask with loudspeaker cabled to the line transformer fits into the ring with a handy turning movement. 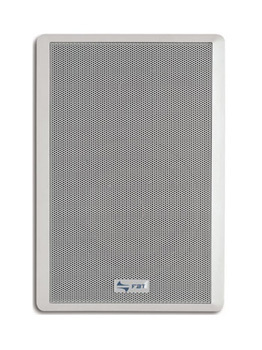 According to the specification of the EN 54-24 voice evacuation system, this range of speakers has a double-galvanized steel flameproof cap, combined with ceramic input/output terminal strips, a thermal fuse and a ground termination. 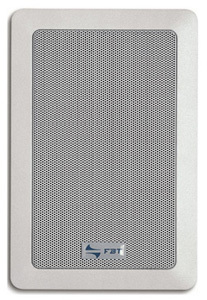 The built-in transformer enables connection to constant-voltage lines at 100, 70 and 50V with the adjustable outputs.